Just before Christmas I was in the mood for some new make up. I had my favourite eyeshadow palette (this one) that I burning through pretty quickly. My favourite colour was a warm red/plum and I was keen to find a back up/replacement. I was also in the mood for a new lipstick. I wanted something subtle that would make me feel like my make up look was complete, without a bright bold lip colour. While out I stumbled upon the Urban Decay counter. There I found some nice eyeshadow singles and was reminded how much I liked their formula. I also found a nice lipstick that seemed to fit the bill of what I wanted. They had an offer on where if you spent £50 you got £10 back on your Beauty Card. A colour correcting concealer for my poor dark circles also found it’s way into my basket to hit the £50. I’m aware that the Petite Heat palette isn’t a couple of singles! It was on sale and ended up not being much more than a couple of singles so I figured it would be more economical to buy a full palette. To be honest, I’m not a singles person. My make up storage doesn’t really suit singles – they’d get lost. Given my love for warm eyeshadows, it was inevitable I ended up with one of the Heat palettes. The two colours on the right hand side are a little too dark. But the rest I knew I’d love to use. I could see myself using these together or separately very easily. Wild Thing was definitely my favourite before I used the palette. Once I used these, my opinions changed. The two lightest colours were very soft and easy to use. The darker they got though, the harder they became to work with. The above swatches are two finger swipes and they got very patchy. They also came out quite a bit darker than they looked in the pan. Hot Spell wound up being the colour I used the most. Overall I was disappointed with how these colours looked once applied, and wished I’d spent more time swatching in the shop. These are very soft shadows, much softer than I remember in my old Naked 2 palette. Unfortunately (and I think I’ve said this before on the blog) Urban Decay shadows just don’t seem to last like they used to. I remember getting all day out of my Naked 2 or even older UD palettes. I get to around 1/2pm and my looks start to fold now, even using primer. I’ve just upgraded to the Nars Primer so I’m hoping this might help it last the day. I was hoping for a little assistance in picking out a lipstick. I’m not good at choosing lipstick colours for myself. Sadly the UD assistant didn’t really give much guidance or help so I just went with the colour I liked. This has a really subtle shimmer to it and a sheer finish to it. It’s just perfect to finish off my look before I head to work. It doesn’t last a huge length of time, but I do drink a large cup of coffee as soon as I get into work. The colour pay off is good but if you’re after a long lasting lipstick, this isn’t it. This is where the assistant redeemed herself by helping me out with my dark circle issue. I’d been considering the All Nighter Concealer for my under eyes after hearing rave reviews about it. When I explained around my eyes was very dry she advised me to get the colour corrector instead as the All Nighter would be way too thick for under my eyes. I still need a normal concealer over the top of this, but it does a good job of helping my under eyes not look quite so dark. It’s quite thin and so although it does fold a little in the lines under my eyes, it’s probably the least of any concealer I’ve used under them. 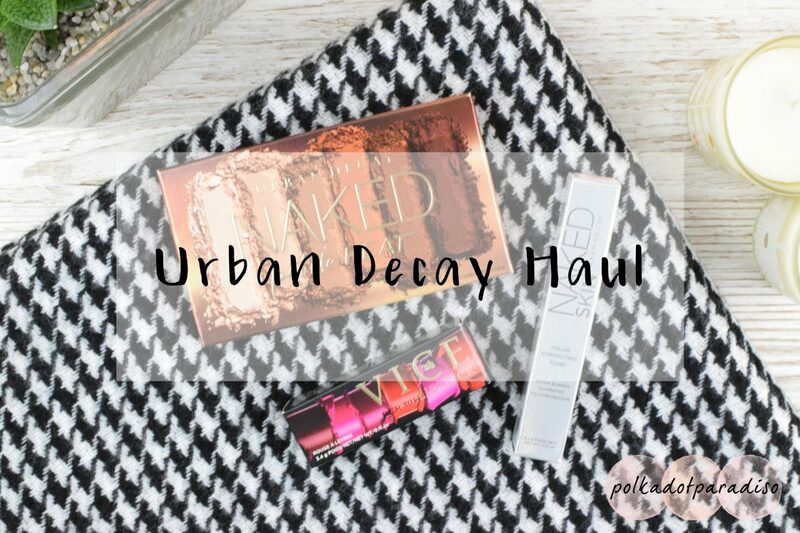 This has been my first purchase from Urban Decay for a while and I was a little underwhelmed with everything except the concealer. While I’m not put off from UD forever, I’ll definitely consider any future purchases a little more.